This walk: 2018-2-12. 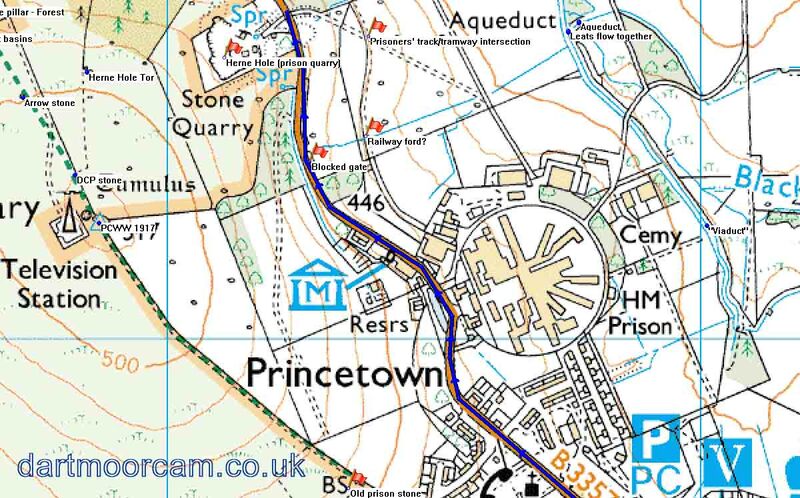 HMP Dartmoor, water reservoir, prison gate and bell, prison dairy yard, Prison Leat features, Herne Hole - prison quarry entrance, b;ocked gateway. Previous walks in this area: see 2018-4-20 The Touch Stone/Naphtha Tramway for a second walk associated with the old Omen Beam Naphtha Peat Tramway 30th March 2011. Further reading: Eric Hemery (1983), Walking the Dartmoor Railroads, David & Charles, Newton Abbot, pages 39-46. This walk was undertaken as part of planning for a walk to see the old horse-drawn Omen Beam Tramway, also known as the Naphtha Peat Railway, that operated from 1846. It ran from a site inside today's prison, north-west onto the moor to a terminus midway between Great Mis Tor and Holming Beam. There were exensive peat ties extending towards Greena Ball (which was known as Yearlick Ball) and Black Dunghill. A side branch ran to Holming Beam - then known as Omen Beam. This was a period when the original prison was closed after it had been built (1806-1809) to house French prisoners from the Napoleonic War (1803-1814) and, later, American POWs from the War of 1812. Naphtha? This is a volatile product that was obtained by heating peat in a distillation process where volatile vapours are driven off, collected and condensed into liquids again. Peat contains about 65% volatile matter - see Legendary Dartmoor - Peat. The British Patent Naphtha Company was founded in 1844 and rented the old prison space in 1846 when they built the gas plant, converting the old infirmary into a gas house i.e. gas works (Devon & Dartmoor HER - MDV 114496) and tramroad. The company operated for perhaps ten years, when a gas works opened in 1875 in Princetown that supplied the prison as well as the town. Naphtha was used as a gas for lighting and as a flammable solvent similar to heptane and lighter fluid. Candles and mothballs were also produced from naphtha. Source: Helen Harris (1968 & 1986), Industrial Archaeology of Dartmoor, David & Charles, Newton Abbor, p. 106. The solvent is still used today e.g. for cleaning electric guitars! Snippets from 1806 newspapers and gazettes. This first part of the walk was to try and see the inaccessible part of the railway described by Hemery, inaccessible because it is on prison land that has no public access. While he says that a few views of the tramway are possible (written in 1983), I can honestly say that I saw little if anything of the embanked track because of the young trees. I think a lot have been planted in the intervening thirty-five years. The photographs below are mostly of items mentioned by Hemery on this part of the walk. The second part of the walk is from the main B3357 Tavistock-Two Bridges road out onto the moor and this will be done in the near future. SUPPLIED WATER TO THE PRISON. HM Prison Dartmoor Main Gate - Historic England Record: HM Prison Dartmoor: Outer Gateway, Flanking Houses and northerrn outbuilding. The inscription over the gate - PARCERE SVBJECTIS - incomplete Latin sentence from Vergil, omitting "et debellare superbos"; meaning "Spare the vanquished and subdue the arrogant", i.e. in short form, "Spare the conquered". The bell, presumably for raising the alarm. Looking inside the dairy yard - 1. Looking inside the dairy yard - 2. Looking inside the dairy yard - 3. From Eric Hemery's description (p.40), the old building to the right is the original stables block dating from when the prison was built (1806-1809 (to house prisoners from the Napoleonic War (1803-1814) and, later, American POWs from the War of 1812. The roadside stone and sluice valve stones seen together. The two iron rings in the stone are of unknown function. Looking along the Prisoin Leat (now unused) running inside the prison land wall, beside the road from the prison to Rundlestone. Looking over the wall besdie the gate, at the prisoners' track coming to the quarry from the prison. Blocked gate on the right, stone by the sluice in the Prison Leat further up the road on the left. Another house sign seen a property or tow from the first. This walk was reached by parking on the road near St. Michael's Church in Princetown.